Memorial services are often somber affairs, but when the person being honored lived well beyond the biblical three score and ten, was productive, nay, indispensable, up until his final days, left behind a list of accomplishments that would have been impressive had they been parceled out among a dozen lesser mortals, and touched the lives of hundreds if not thousands of people who prized his quirks and kindness as much as his almost superhuman ability to solve problems and get things done, it may not be out of place if those singing the deceased’s praises introduce a note of levity into the proceedings. The motley crew included an emeritus Harvard president, several union organizers (including the former president of the AFL-CIO), the chairman and CEO of a major international manufacturing firm, and a former U.S. secretary of labor. 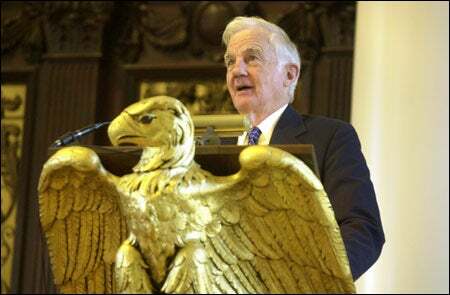 They had all come to Memorial Church Dec. 12 to pay their respects to Dunlop, the Lamont University Professor Emeritus, economist, labor negotiator, and public servant who advised almost every U.S. president since Franklin Roosevelt. Dunlop died Oct. 2, 2003, at the age of 89. Former Harvard President Derek Bok described his first meeting with Dunlop two years into Bok’s tenure as a Harvard Law School professor. Bok said that Dunlop “literally rescued this university on more than one occasion” – once when he was appointed dean of the Faculty of Arts and Sciences in 1969 during a period of student unrest and brought stability to the campus through skillful negotiation and firmness of purpose, and again in 1988-89 when Dunlop represented the University in contract negotiations with the Harvard Union of Clerical and Technical Workers (HUCTW), achieving results that were applauded by both sides. Frederick Abernathy, the Abbott and James Lawrence Professor of Engineering, spoke about first getting to know Dunlop in the Old Rogues Bar in the Statler Hotel in Washington, D.C., one of many eating and drinking establishments in which the tireless Dunlop met with associates after or before business hours. Abernathy spoke of the crucial role Dunlop played in creating organizations aimed at advancing American manufacturing, including the Textile Clothing Technology Corporation and the Harvard Center for Textile and Apparel Research. “Research with John always ran smoothly, but it involved a lot of work. John thrived on hard work. He believed that all problems were solvable with hard work,” Abernathy said. Because he urged his students to go out and observe the world directly, Dunlop expanded the horizons of the students he worked with, Freeman said. Another labor organizer who praised Dunlop’s work as a negotiator was Baldemar Velasquez, president of the Farm Labor Organizing Committee of Ohio. Dunlop worked with him in the 1980s to settle a dispute between the farmworkers and the Campbell Soup Co.
Velasquez said that he and his fellow union members always referred to Dunlop as “El Professor” and still include his name in the union role call. “Because of El Professor, farmworkers enjoy vastly better conditions today,” he said. According to Peter J. Pestillo, chairman and CEO of the Visteon Corp., Dunlop had a profound impact on each of the many commissions and research groups on which he served. “All the groups he belonged to were always known afterward as the Dunlop something-or-other,” he said. W.J. Usery Jr., who succeeded Dunlop as U.S. secretary of labor after Dunlop resigned in 1976, said that he first met Dunlop in Washington in 1956. Usery had been assigned to Cape Canaveral, Fla., as a union official, and Dunlop remarked that he had just been there. “It seemed that everyplace I went in my career, he had just been there,” Usery said. But the quality that Dunlop will best be remembered for, he said, is his ability to focus on and lock in on anything that engaged his mind and the fact that that mind was as keen at a late-night discussion as it was at a breakfast meeting.